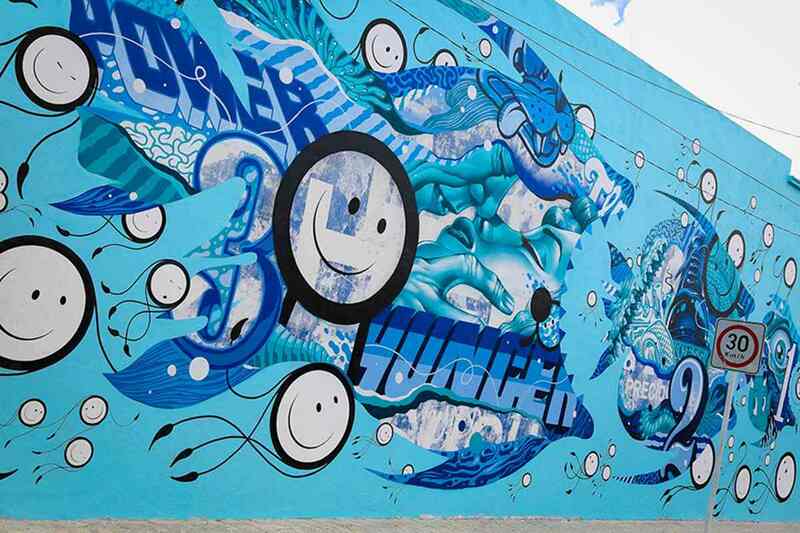 With another edition of Sea Walls: Murals for Oceans behind us it is time to see what were some of the best pieces created for the occasion. 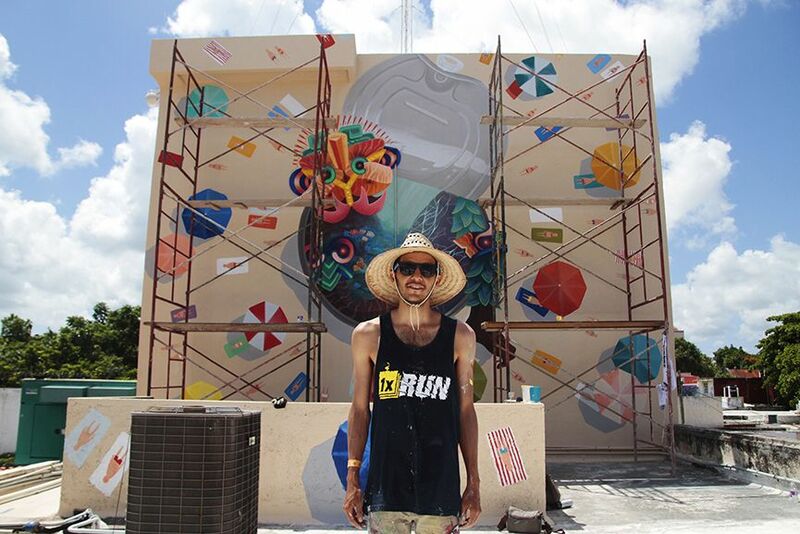 With 35 large-scale murals painted on the Caribbean Island of Cozumel, Mexico during the last month, it definitely wasn’t an easy choice to make. 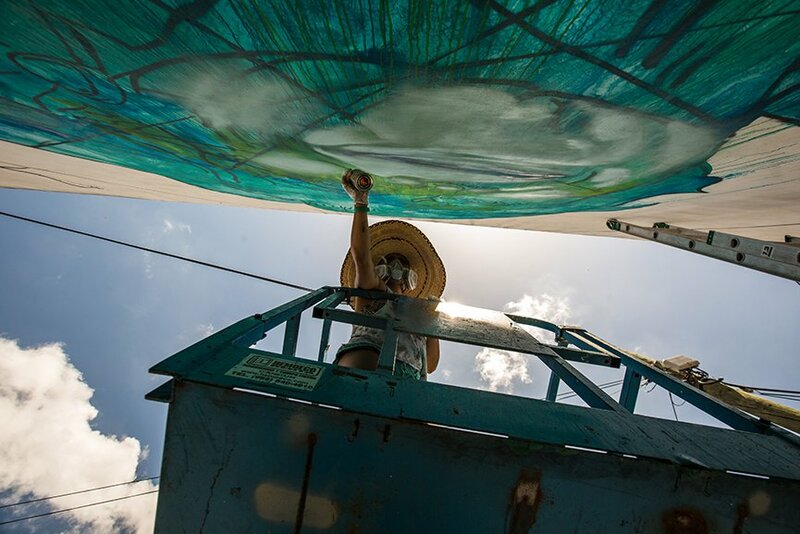 Just like in 2014 the festival was organized by the PangeaSeed, international association dedicated to the preservation of oceans and marine species in peril. 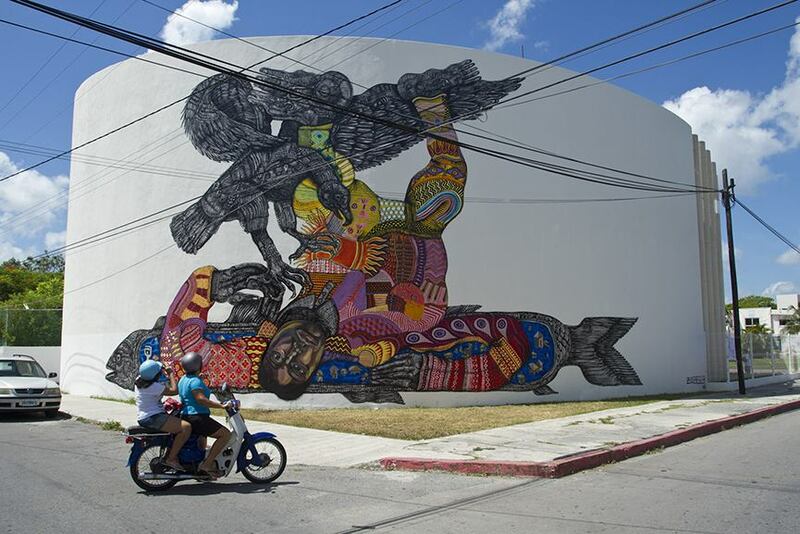 Eleven artists from Mexico and twenty-four internationally acclaimed muralists joined forces with PangeaSeed and local activists to raise awareness and educate local communities in the field of nature conservation. 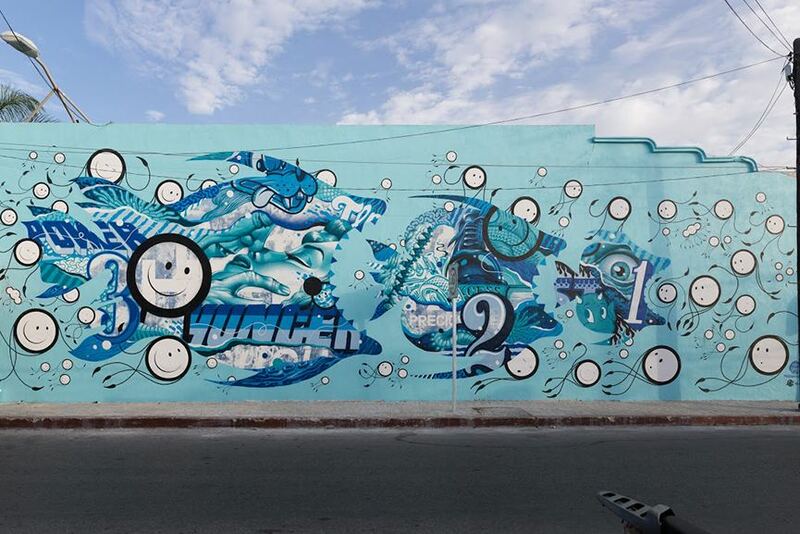 Their magnificent works address the current environmental issues through a series of specific themes with all murals being based on interesting, yet disturbing facts about the current state of the ocean ecosystems and endangered marine species. 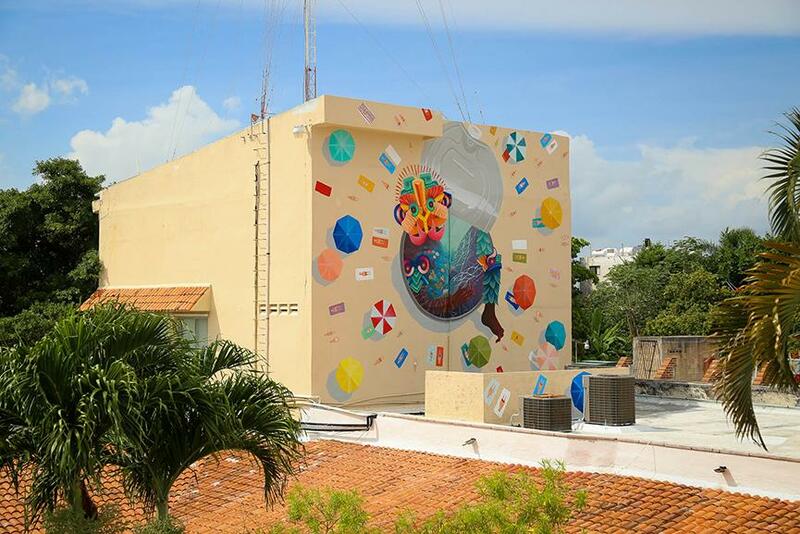 The Brazilian collective Bicicleta sem Fraio based their work on the subject of plastic pollution. 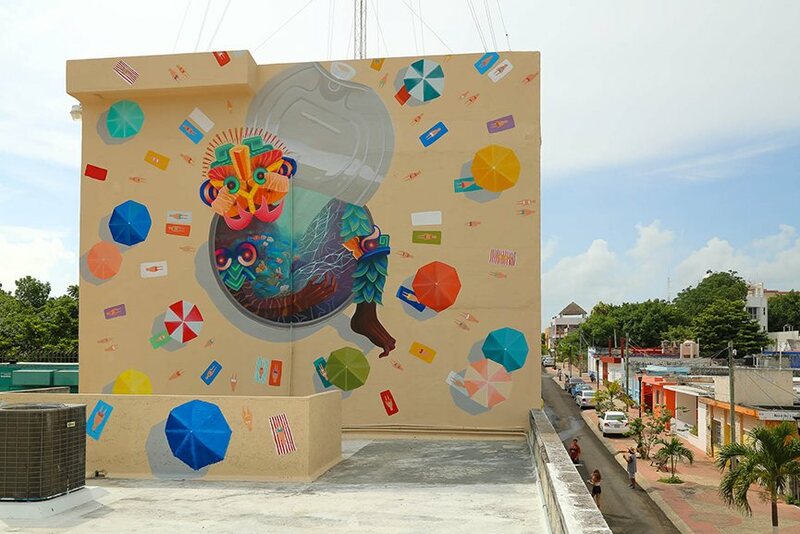 Their latest mural keeps that colorful and psychedelic style recognizable for this group of illustrators and at the same time refers to the serious issue of the uncontrolled disposal of plastic waste. 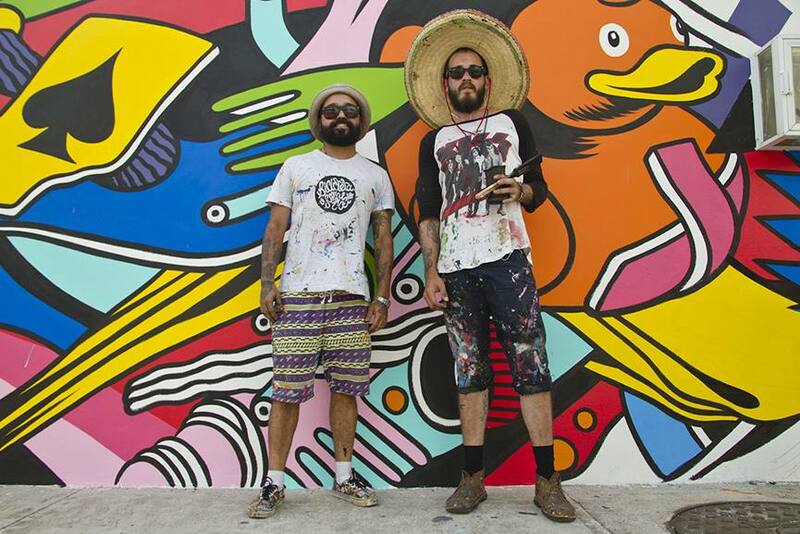 Plastic debris is still one of the main pollutants, killing countless ocean inhabitants each year and Bicicleta sem Fraio collective did an amazing job in addressing this problem. 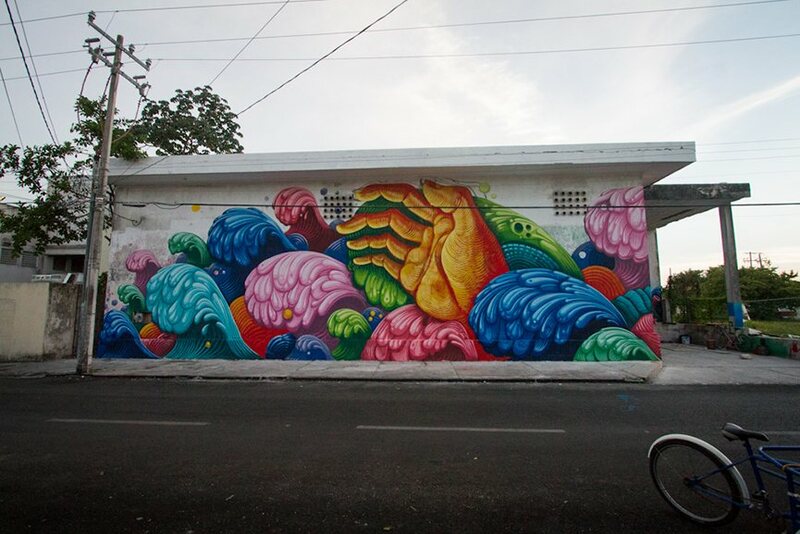 Favio Martinez aka Curiot is one of eleven Mexican participants in Murals for Oceans. 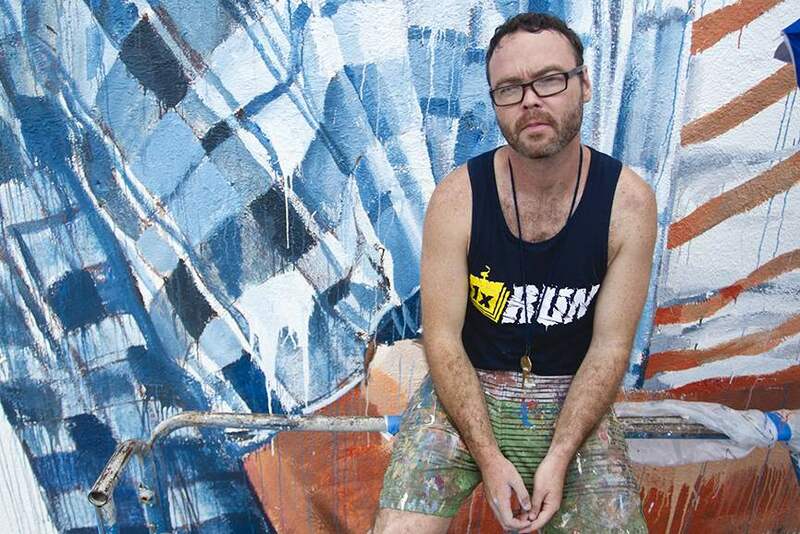 His large-scale mural questions the idea of coastal development. 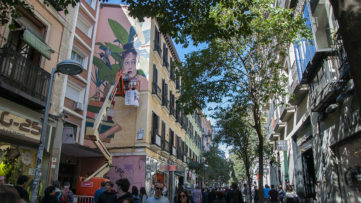 Curiot is exploring how massive influxes of tourists affect the local environment increasing the need for additional water supply, adding to the pollution of the area and putting local habitats and infrastructure under great pressure. 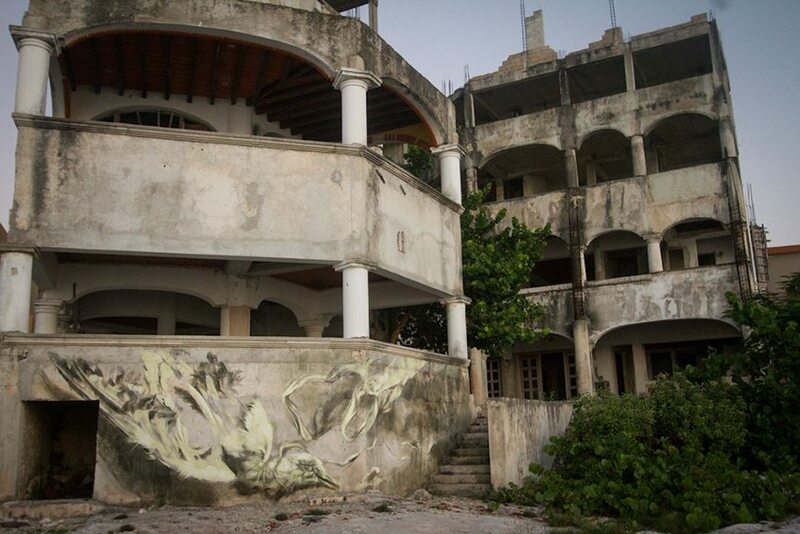 His mural visually represents how this proliferation of tourists puts local ecosystem in an endangered position. 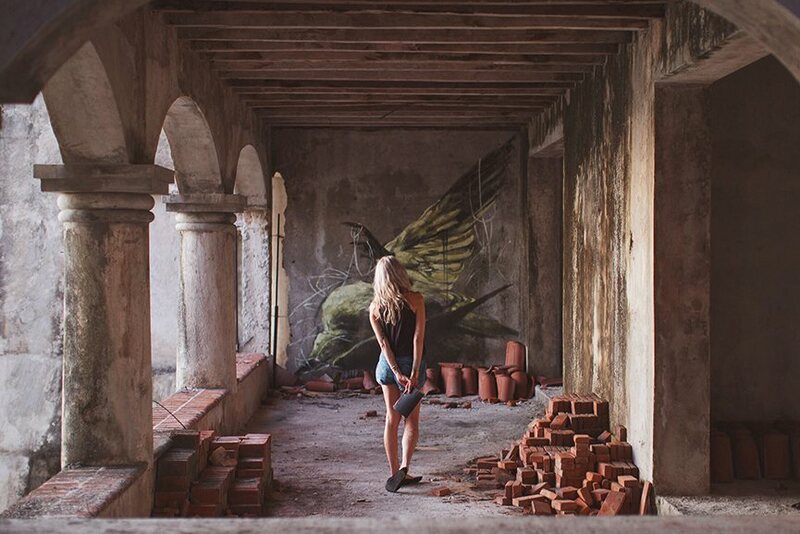 Faith47 is a self-taught street artist from Cape Town who works in various mediums, often with found objects which she cleverly incorporates into the artwork. 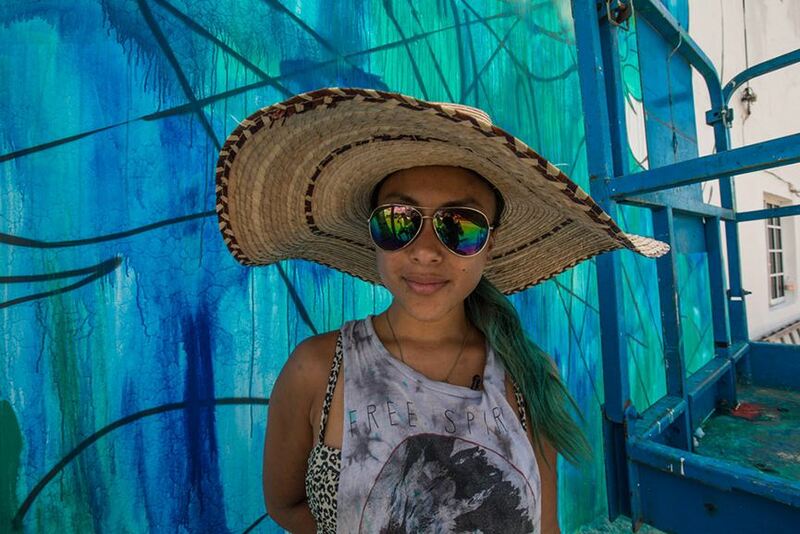 For Sea Walls Mural for Oceans, she created two public pieces depicting tormented birds, caught in the net of disposed plastic. 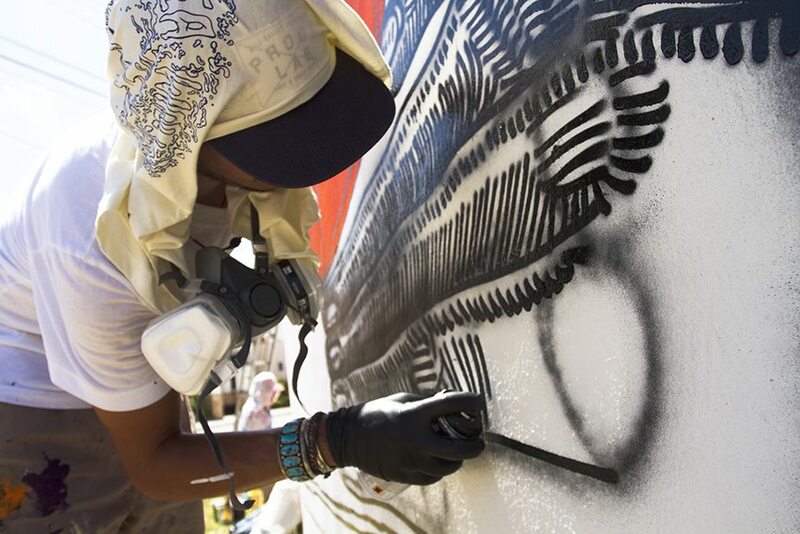 Having in mind the fact that birds are the second group of animals largely affected by the plastic pollution. 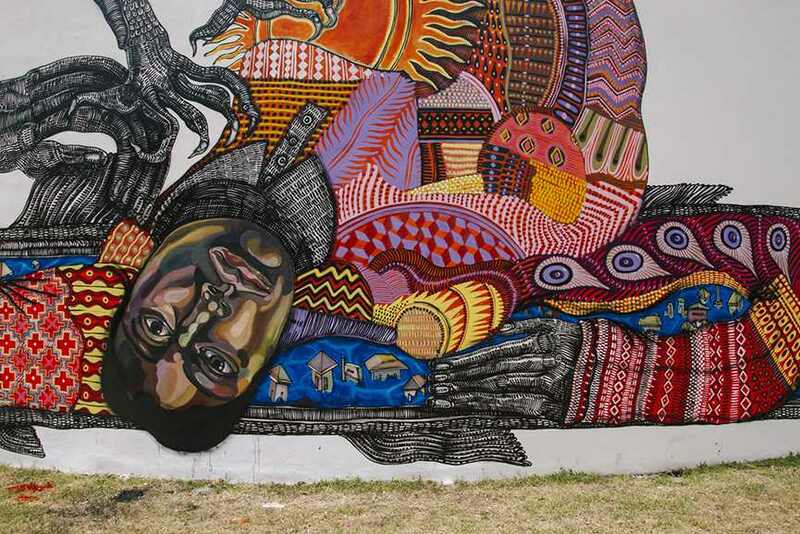 These tortured and suffering subjects of Faith47 are bound to provoke compassion and make observers rethink their everyday practices. 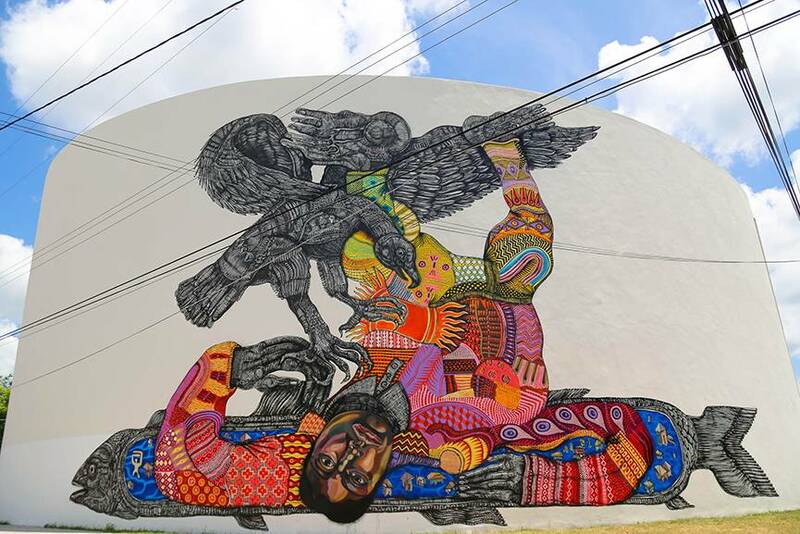 Contemporary US artist Zio Ziegler explores the topic of the climate change, one of the most important environment concerns of our age. 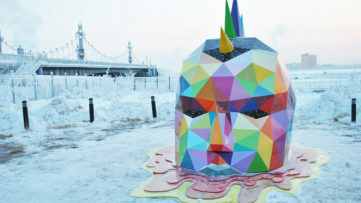 Ziegler’s artistic practice is often reflexive and thought-provoking, raising questions rather than giving a definitive answer. 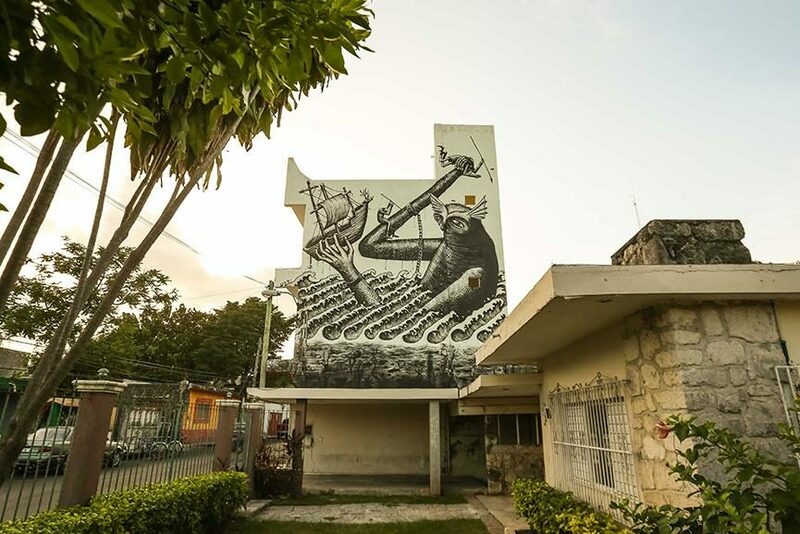 The consequences of climate change are affecting every species on our Planet and his latest mural gives a discouraging picture of the collapsing ecosystem if no effort is made in finding a solution to this global problem. 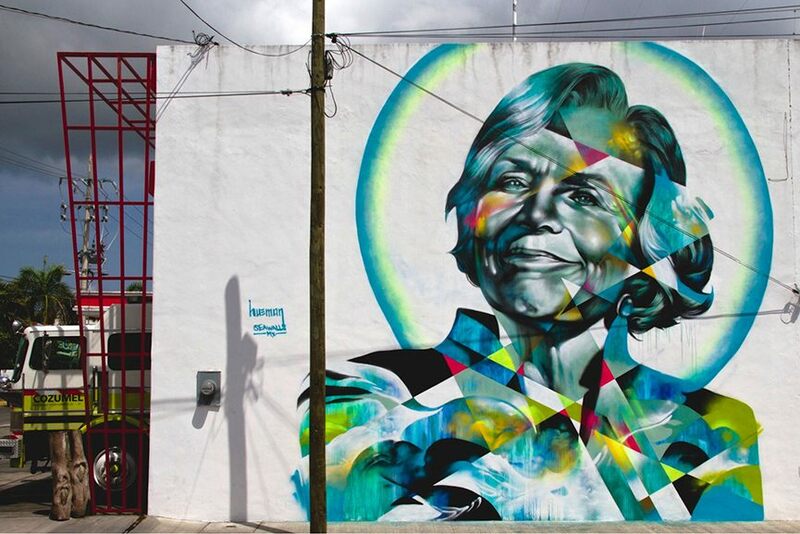 Californian artist Allison Torneros aka Hueman created a mural honoring the work of Dr. Sylvia Earle, marine biologist known by the nickname Her Deepness. In 1998, this National Geographic explorer was named the first “Hero of the Planet” and in 2008 she won the TED prize for her efforts in protecting the marine environment. 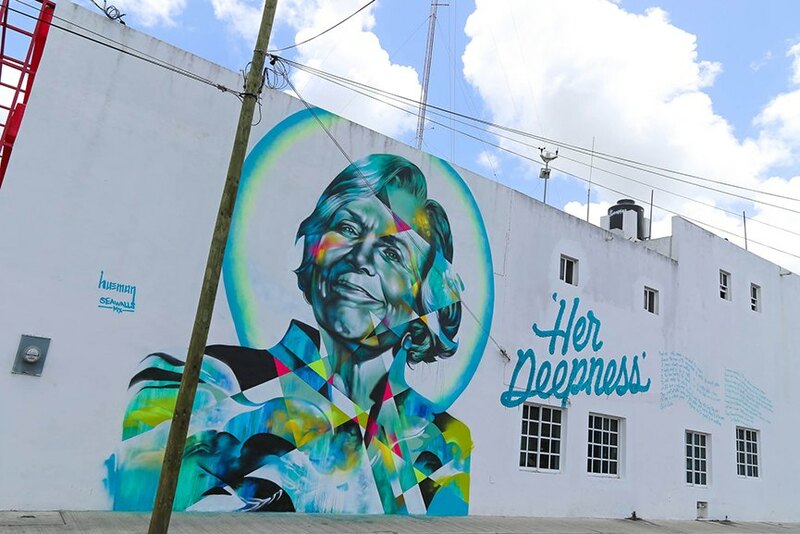 Her Mission Blue, campaign to create a global network of marine protected areas was recently featured in a documentary and honored once again in Hueman’s amazing public piece. 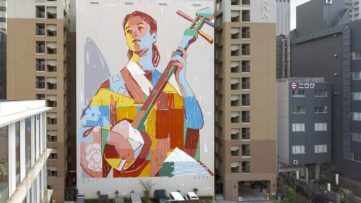 The theme of traditional fishing techniques is explored in the work of Fintan Magee, the Australian designer, illustrator, and muralist. 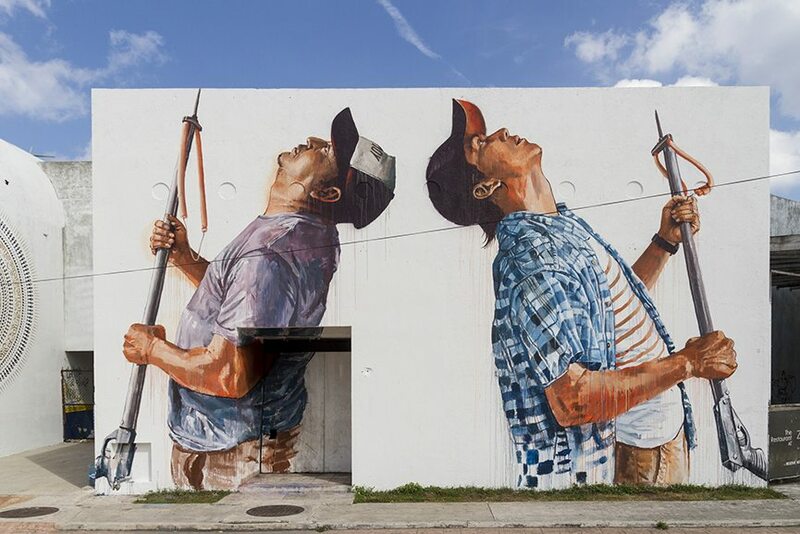 Fintan Magee portrays fisherman working together with the older passing his knowledge to younger generations. 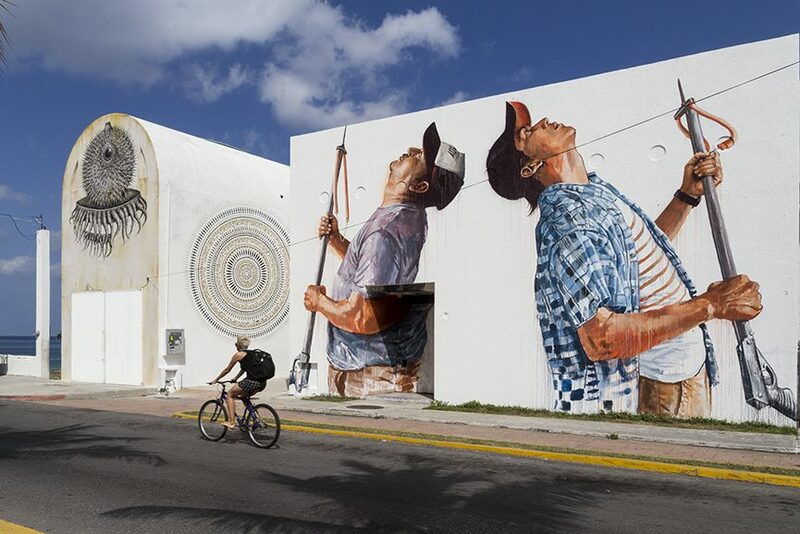 The passing of the traditional fishing skills is a crucial point in keeping the sustainability of marine natural resources and Magee’s piece serves as a motivational message to people of the local community. 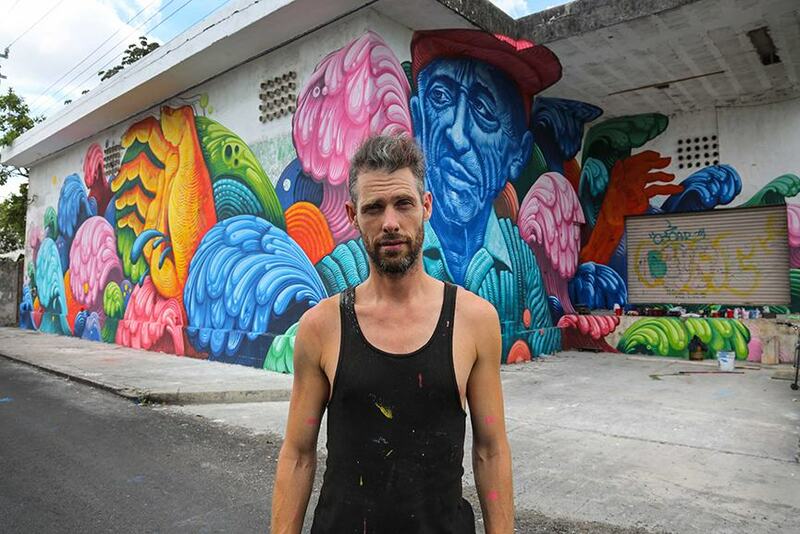 The mural made by the US artist Jason Botkin is a tribute to the captain Jacques Cousteau one of the most important figures in the environmental movement. 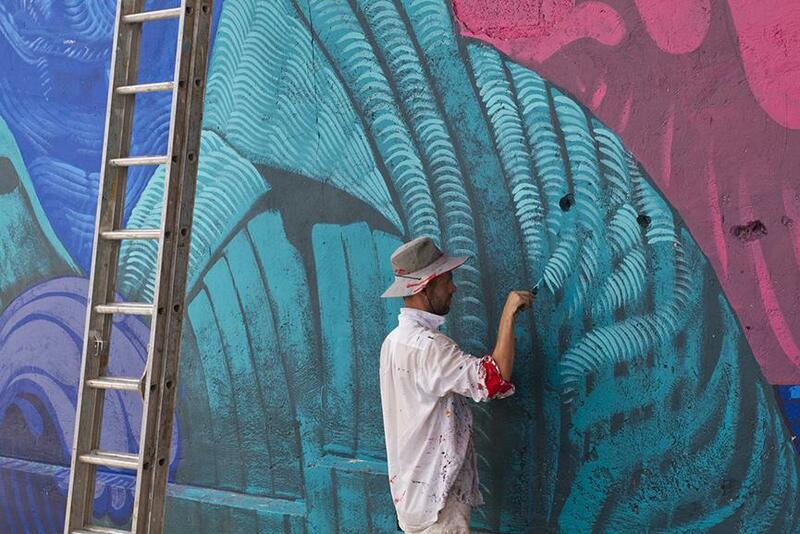 This French marine officer was one of the pioneers in marine conservation whose exploration of the oceans and sea life was documented in various books and documentaries. 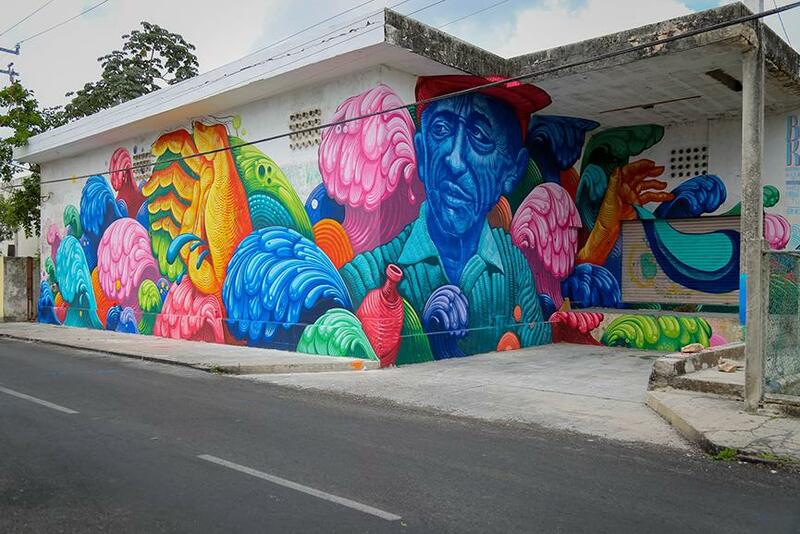 The colorful mural by Jason Botkin honors the life and work of this iconic explorer, one of the first persons to draw attention to disastrous effects of human mistreatment of the environment. 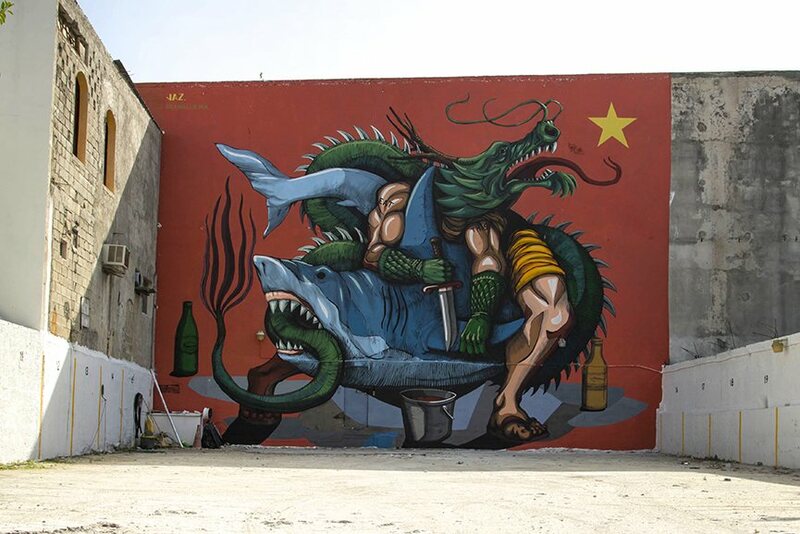 Franco Fasoli, better known to street art enthusiasts as JAZ is making an appeal to people to rethink the way they feel about sharks. These sea creatures are globally perceived as highly dangerous predators, although the facts show that falling coconuts kill more people than sharks annually and that this myth only supports killing of the sharks for trading and consumption practices. 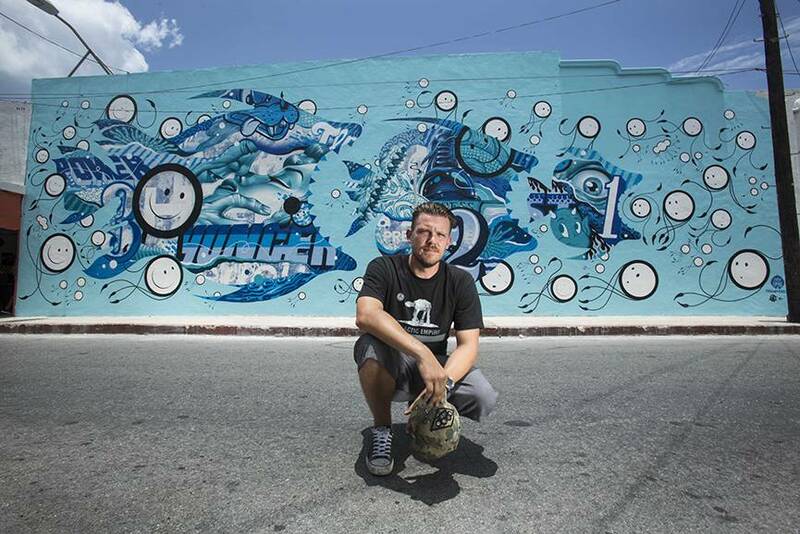 JAZ addresses the issue of potential extinction of the sharks in his latest mural portraying humans as merciless creatures, much scarier than the feared animal. 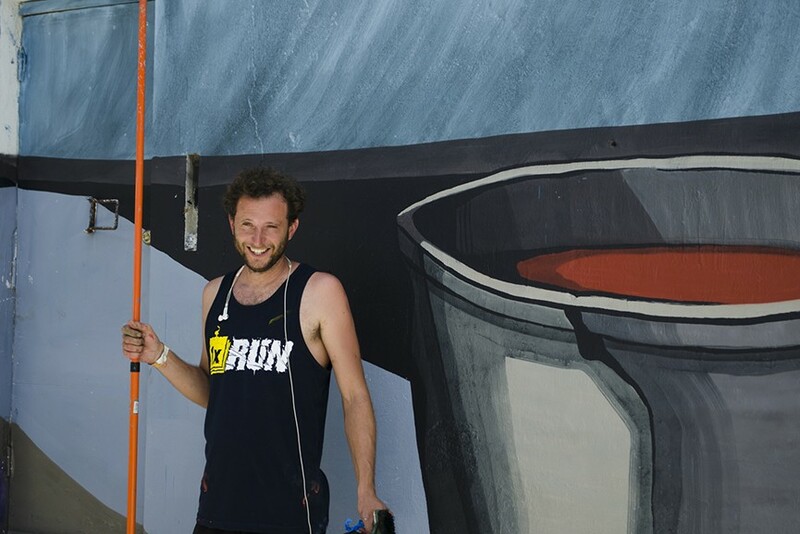 British muralist Phlegm continues the line of critique of those destructive fishing practices. 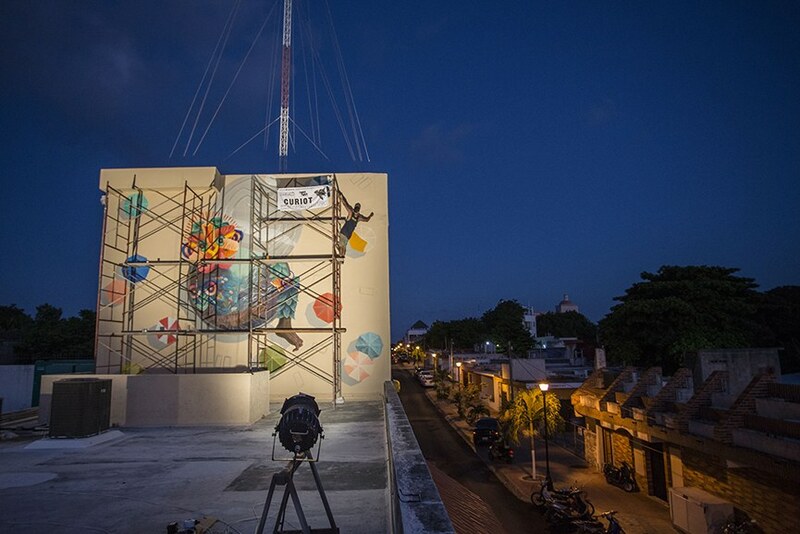 As the reports state 90% of the ocean’s big fish have been fished out, and not only sharks. 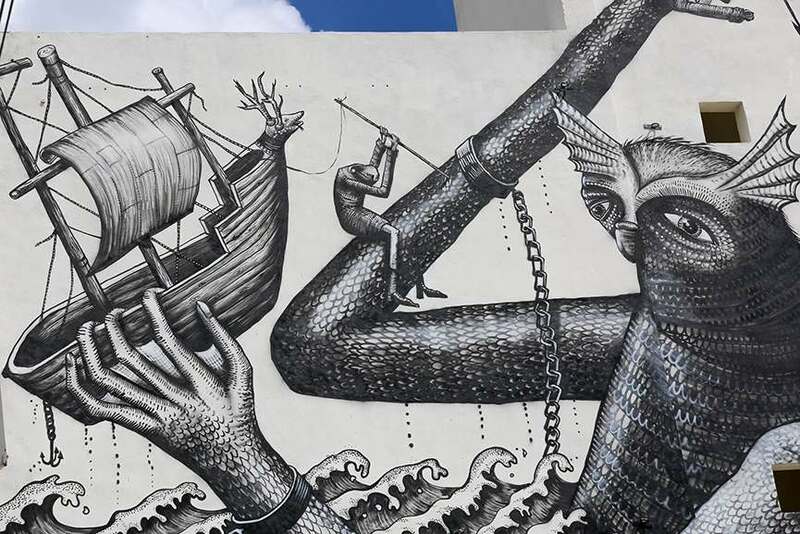 In his recognizable illustrative style, Phlegm depicts chained, sadly looking sea monster battling for his life with the armed fisherman. 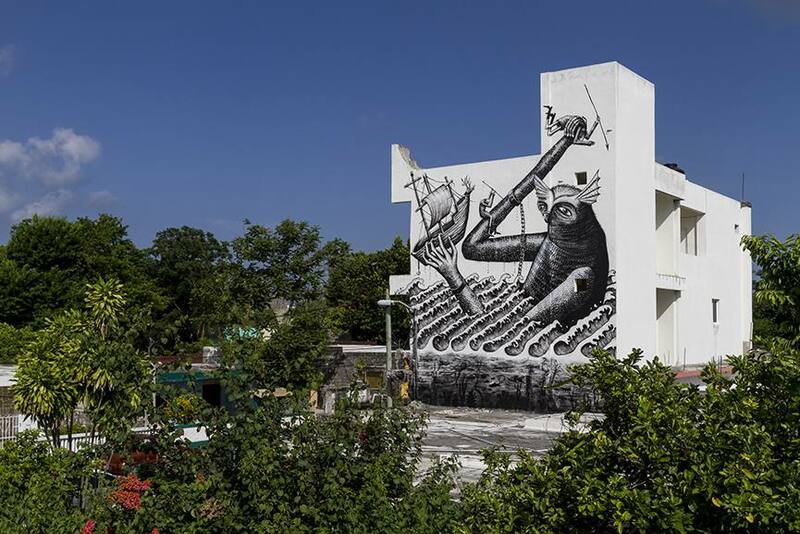 His black and white mural continues the sequence of Phlegm’s storybook imagery, this time bringing his imaginative work to the fight for animal rights. 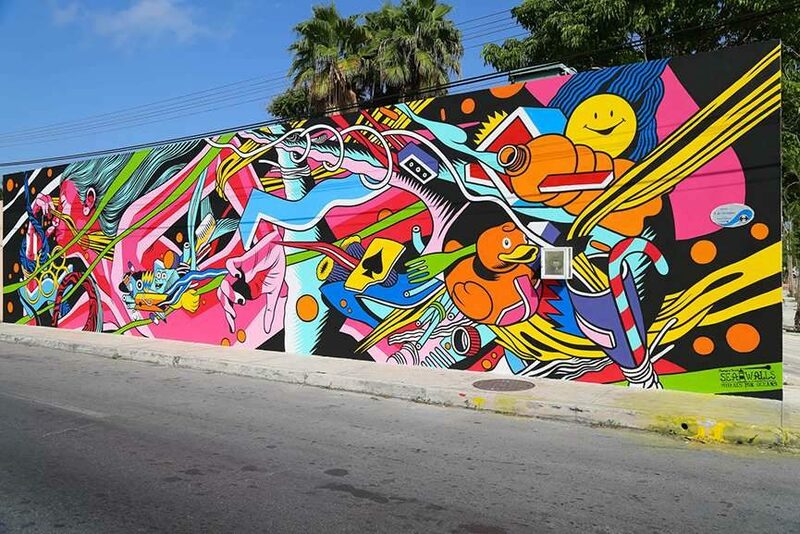 American graffiti artist Tristan Eaton and UK duo The London Police collaborated on a mural which explores the role of capitalism and its impact on the current state of the ocean ecosystems. 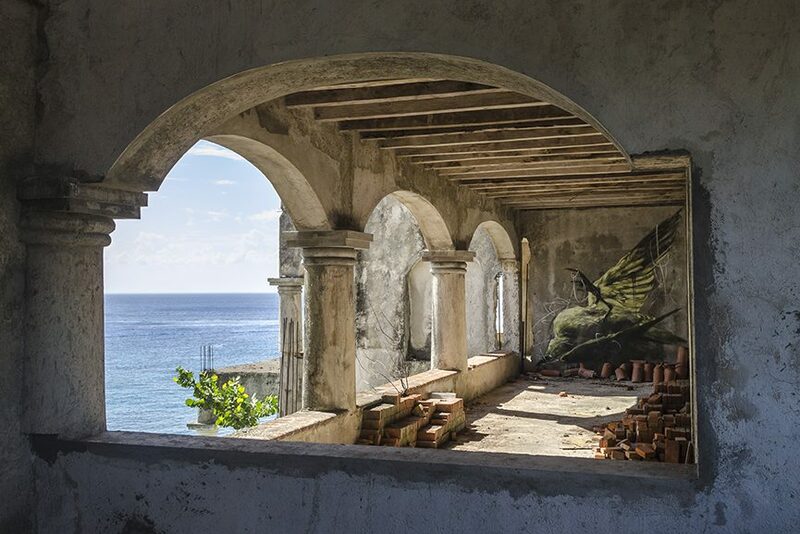 With coastal nations selling their fishing rights to international corporations, it is not only the local economy being destroyed but also the nature-friendly traditional fishing practices. 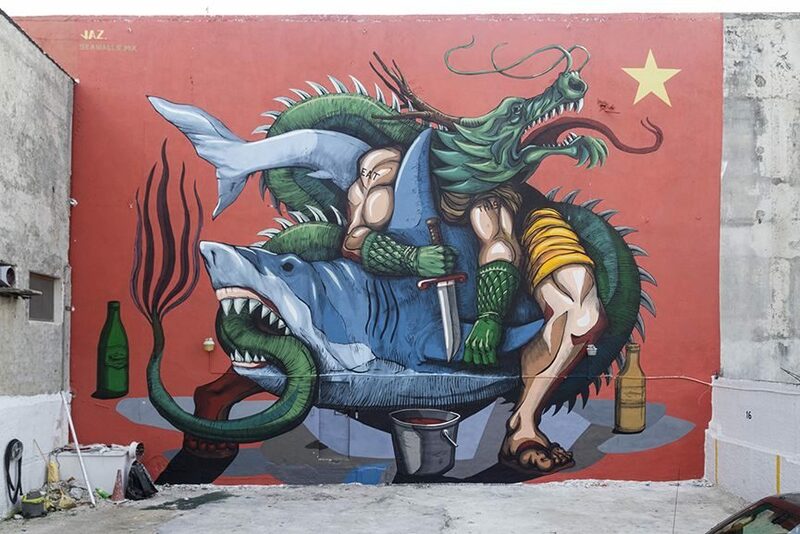 The exploitation of local fisherman goes along with the destructive overfishing practices and these artists did an amazing job in addressing the subject. 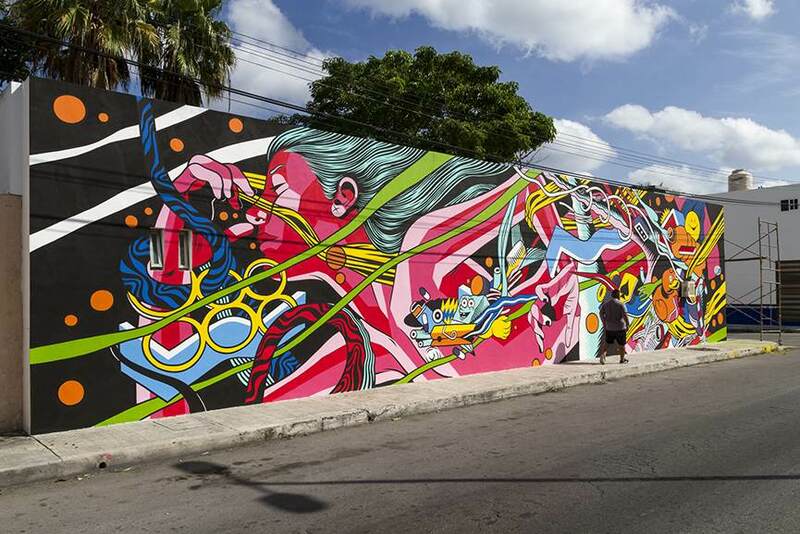 For more murals created during the festivals worldwide sign up for My Widewalls for FREE!